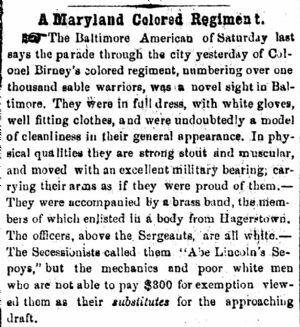 The Baltimore American of Saturday last says the parade through the city yesterday of Colonel Birney's colored regiment, numbering over one thousand sable warriors, was a novel sight in Baltimore. They were in full dress, with white gloves, well-fitting clothes, and were undoubtedly a model of cleanliness in their general appearance. In physical qualities they are strong stout and muscular, and moved with an excellent military bearing; carrying their arms as if they were proud of them.— They were accompanied by a brass band, the members of which enlisted in a body from Hagerstown. The officers, above the Sergeants, are all white.— The Secessionists called them “Abe Lincoln's Sepoys,” but the mechanics and poor white men who are not able to pay $300 for exemption viewed them as their substitutes for the approaching draft. If the brass band were from Hagerstown it might have been the Moxley Band.